Psst! Steve has been in Wales! Wales! Wales!! since last week. Fantastic Visit to Swansea City. “Huge thanks and congratulations to Carolyn Williams for getting her hat-trick! First Cardiff City, then Cowbridge and finally Swansea City. 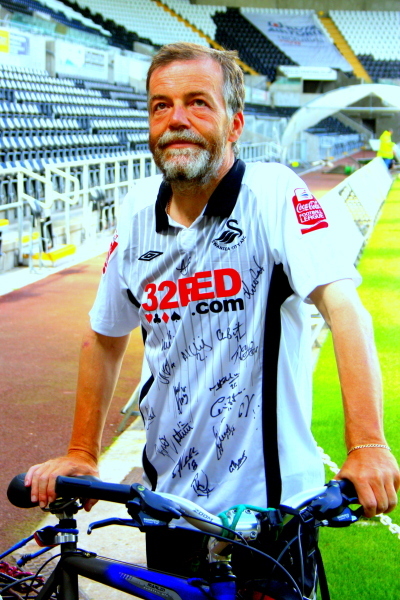 We were met at the ground by two lovely Swans’ employees and presented a signed shirt pitchside. It was also a great opportunity to explain to both the Swansea City ladies as well as the local newspaper the purpose of the whole journey. Hopefully they realised that the world’s 45 million refugees were worth cycling for. This stark figure certainly keeps me going. From the Liberty Stadium, it was a dash down to Morgans Hotel where Carolyn had arranged a reception in this prestige venue. It was a delight to talk to the GM, Christine Owen, and I was able to thank her for a raffle prize they had offered. There was a good number of Ecademists, football fans and others present including Carolyn, Simon “Web Wizard” Jones and Carolyn’s daughter Emma. Thanks to all for making this such a memorable day for me and such an important milestone in the journey. 68 clubs now visited and now it’s the long, long trek to Plymouth Argyle, Torquay United and Exeter City. Wales has done The Shirt proud. Thanks, Carolyn and all who have supported you”. Sam Borrett (a fellow ecademate) said it well ” If you really want something be single pointed and go like an arrow towards the target.” I would add “This is definitely a winning by sharing story. Throughout Steve’s journey from Cardiff to Cowbridge we have enjoyed some Fab Company. Click here to see photographs courtesy of Mike Briercliffe taken of Steve in Swansea’s Liberty Stadium and the Morgan Hotel. Yesterday, at 6am, we both attended the Swansea Waterfront BNI Chapter (my previous chapter.) I took Penny Power’s OBE book ‘Know me, like me, follow me’ as part of my me sixty seconds presentation. Following Steve’s journey since last Friday he wrote “I’ll have an early night, look forward to Swansea Waterfront BNI and then I am off, head down, to Plymouth, Exeter and Torquay. What a journey. “There are laws of science there are universal laws.” Yes Steve Hall’s 45 million refugees and climbing journey is testimony to that! As Steve continues his cycle to South West to join Milton, in Southend, here’s twinkling you on throughout this your final leg of this project. Following Steve’s intention I am reminded of something Nic Oliver once posted – ‘A safe return is the best part of the journey’. You can read about Steve’s remarkable The Shirt 2010, his story about cycling to 92 Football League Clubs. In June 2015 Steve will start out to cycle from Kirkenes on the Norwegian/Russian border to visit all the clubs in the top three divisions of Norwegian football.Yes, that’s some 5000 kms and 100 nights. The intention is to get 5000 signatures on one football shirt! Wishing Steve another massively successful Norwegian/Russian cycle ride in 2015. Please Click here: http://www.theshirt2010.co.uk/ to follow Steve and add your much needed support. How do you re-energise yourself for business? This entry was posted on Tuesday, December 30th, 2014 at 4:01 am	and is filed under Business, Fitness, Health, Mentoring, Wellbeing. You can follow any responses to this entry through the RSS 2.0 feed. Both comments and pings are currently closed.